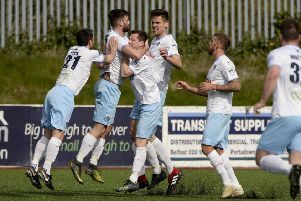 Ballymena United midfielder James Knowles is sure the Sky Blues will put next week’s BetMcLean League Cup Final against Linfield out of their minds as they travel to face Institute in the Danske Bank Premiership. David Jeffrey’s United are sitting second in the league standings and are in good form but midfielder Knowles knows that Stute will be up for the encounter with new interim manager Kevin Doherty in charge after boss Paddy McLaughlin moved to Cliftonville this week. “It will be tough and the pitch down there is massive and we know they are going to play football and try and take legs out of you. “Down their the last time it was 2-1 and it was a really tough game and we are thinking it is going to more of the same. “And when chances come along we have to take them. And Knowles says he is enjoying life in the Sky Blues engine room with Leroy Millar and Jude Winchester as the season progresses. “I think it suits us very well and Leroy and Jude are two very good players. And I think they are two under rated players and I try and sit and give them the confidence and freedom to do what they can do. “They like to push forward and I try and sit in and give us shape in the middle of the park. “I do more of the dirty side of the game and work hard for the team, while they go and express themselves. And Institute’’s caretaker boss Doherty has refused to comment on Michael McCrudden’s self-imposed exile as he focuses on guiding the club through a difficult period. ‘Stute’s skipper and top goalscorer, McCrudden claimed he won’t be returning to the club after signing an 18 month pre-contract with Derry City which comes into effect next summer, Doherty admits the situation is out of his control. “I can’t comment on Michael,” he said. “I don’t really know what’s happening. I know he’s signed a pre-contract with Derry City and he’s entitled to. Derry are getting a very good player and a very good person. “I’ve worked with him and he’s very personable but we’ll see what happens in terms of who’s available for Saturday. “It’s out of my hands. I’ll make a judgement call in terms of who’s available and take it from there. According to Doherty, it’s just a short-term fix until the club find a permanent successor and he hasn’t looked beyond the visit of the Braidmen tomorrow. “I’ve been asked to take the team for Saturday to give the Board a bit of time to get themselves right. “I got the call on Sunday night and I had a few personal things to sort out so it’s only been really today (Thursday) that I’ve got around to trying to work out and plan for Saturday.